Elizabeth Vernon was an oft-painted court beauty, and her iconography is impressive. Among her portraits is a spectacular full-length in The Buccleuch Collection, Boughton House, as a young girl, c. 1598, by an unknown artist, in a richly embroidered gown, brushing her long flowing hair, a sure reference to early portraits of the Virgin Queen, standing by a table with an open casket of jewels, her ermine-lined cloak and cartwheel ruff laid out on a bed beside her. It was clearly painted to celebrate her ‘coming out’ and appointment as a Maid of Honour to Elizabeth I. Another bust-length portrait at Boughton House from the circle of William Larkin shows her as a young woman, again with flowing hair and a richly embroidered bodice. Private collection, U.S.A. until 2014. 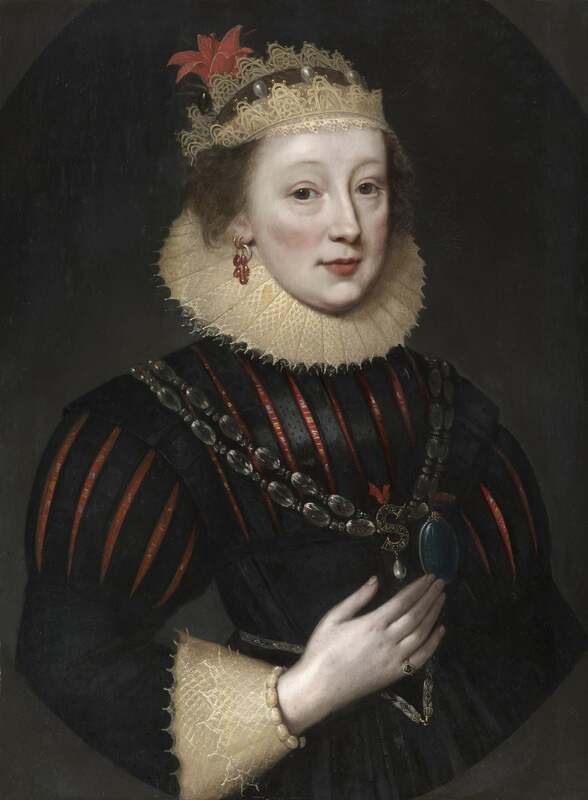 The present portrait by the Flemish artist Paul van Somer, painted around 1620 when the sitter was a mature woman in her forties, is one of a number to adorn various English manors and estates, including three-quarter-length versions at Sherborne Castle and at Welbeck Abbey. She was also painted in 1622 by Marcus Gheeraerts, full-length, in a last great, glittering flourish of a style of full-length court portraiture that, by the late Jacobean period, had already become somewhat passé(with The Weiss Gallery, 1998, now in the Burrell Collection, Glasgow). The most similar version of our portrait by van Somer resides in the National Portrait Gallery, London, also on panel. By 1620 the countess would have been very much in her prime at the Jacobean court, and van Somer has skilfully represented the artifice of Elizabeth’s well-preserved powdered skin and rouged cheeks. She wears a costly black silk gown with slashes that reveal red and gold embroidered silk beneath, and a fashionable saffron lace ruff with matching cuffs and headdress. Her jewels are impressive, with a long double-strung quartz or agate necklace on a red thread across her shoulders, with a diamond studded ‘S’ for Southampton, and a blue enameled miniature case to which she gestures with her right hand (presumably containing a portrait of her husband. Her earring is unusual, with red stones (rubies or almandine pyrope garnets) linked together and then looped up at each end for attachment and she has an unusual double-ear piercing. ‘Faire Mrs. Varnon [sic. ]’ was in her youth one of the most celebrated beauties at court, chosen by Elizabeth I to be a Maid of Honour in chief. Several references to her occur in the ‘gossiping letters’ of the Elizabethan official and businessman, Rowland Whyte, whose epistles were first posthumously published in 1746 as Letters and Memorials of State, (ed. Arthur Collins), providing an insightful context to the latter stages of the Elizabethan court. In them he famously observed how ‘My Lord of Southampton doth with to[o] much familiarity court the faire Mrs Varnon’. Unsurprisingly, in 1598, on discovering she was pregnant, Elizabeth and her lover secretly married, to the ageing queen’s gravest displeasure. By 3 September she had learned of the marriage and consigned Elizabeth to the Fleet Prison. Elizabeth’s lover and spouse, Henry Wriothesley, 3rd Earl of Southampton (1573 – 1624), is today renowned as William Shakespeare’s friend and patron, the dedicatee and ‘fair youth’ of his sonnets, and a cousin to Robert Devereaux, 2nd Earl of Essex. Elizabeth herself was the daughter of John Vernon of Hodnet, Shropshire, by his wife Elizabeth Devereux, whose grandfathers were the Viscount Hereford and the Earl of Huntingdon. Both her maternal grandparents were descended from King Edward III. On relegating Elizabeth to the Fleet Prison, the queen ordered Southampton (who at the time was in France) to return to England forthwith, but he remained in Paris for two months, losing large sums in gambling. By the beginning of November he was back in England, also lodged in the Fleet, where he remained for a month, during which time Elizabeth gave birth to their daughter, Penelope. After their release, the couple were never again received into the queen’s favour. Indeed, Southampton was deeply involved in the Essex rebellion of 1601, and in February of that year he was sentenced to death, later life imprisonment. Luckily for the couple, on the accession of James I in 1603, they resumed their place at court and received numerous honours. That Wriothesley had a love of literature is apparent not only through his patronage of Shakespeare, but also in a legacy of books which he bequeathed to the library of St. John’s College, Cambridge, described in a letter by Elizabeth to Dr. Owen Gwyn, Master of St. John’s, in August 1626, in which she noted ‘the great love and affection that my dearest lord, now with God… designed certain books unto the new library of your House…’. Elizabeth outlived her husband by over thirty years, and as late as 1647 Charles I, after his escape from Hampton Court, took refuge with her at Titchfield, ‘well knowing her to be a Lady of that Honour, and Spirit, that she was superior to all kind of temptation’. Our portrait is known to have been purchased from Halsway Manor, Somerset, and it is likely that it came from the collection of William Mitchell who owned the house between 1924 and 1938. According to the Victoria County History of Somerset, Vol: V (1985), Mitchell appears to have been someone who enjoyed doing up houses, and acquired architectural furnishings for the house from several different sources. This would suggest that he also acquired objects with which to furnish the house, including the present portrait. The descent of the house does not suggest that it was acquired by any family with a familial connection to Elizabeth Vernon. See Illustrious Company: Early Portraits 1545 - 1720, The Weiss Gallery, 1998, no. 12. The miniature case in the version at the NPG is in a red enamel, and her lace cuffs reveal further red and gold silk beneath. Otherwise, the portraits are near-identical. We are grateful to Hazel Forsythe of the Museum of London for looking at her jewels. Printed in the Sidney Letters, ed. Arthur Collins, referenced in R. W. Goulding, Wriothesley Portraits: Authentic and Reputed, Oxford 1920, p. 16. On the eve of the abortive rebellion of Essex he had induced the players at the Globe Theatre to revive Richard II, and on his release from prison in 1603 he resumed his connection with the stage. In January 1605 he entertained Queen Anne with a performance of Love's Labour's Lost by Burbage and his company, to which Shakespeare belonged, at Southampton House. Quoted in R. W. Goulding (ibid. ), p. 17. See R.. W. Goulding (ibid. ), p. 17.